Video lessons are set up in four to five short, easy to follow videos; individual videos are two to four minutes long. Each video explains step by step what you need to accomplish before moving on to the next video in the lesson. With each lesson or song there are printable PDF files that provide the information you need to master your lesson. Just download and print the file. In the guitar lessons, you will learn proper playing techniques, and learn to read music and chord charts. Most importantly, each student is able to learn at his or her own pace, with the ability to review any lesson or video as needed. Learning the guitar requires practice and patience. The more you practice, the better you play. Included with each song lesson is the full length version of the song on an MP3 file. Listen and play along with the MP3 file as you practice the song you've just learned. In Lesson Resources, there is a library of all the songs offered. Feel free to listen or play along with any of the songs. 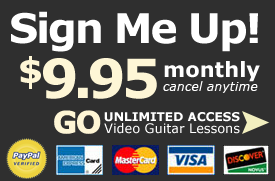 Try a Free Guitar Lesson with no obligation and see if on-line video lessons are right for you.